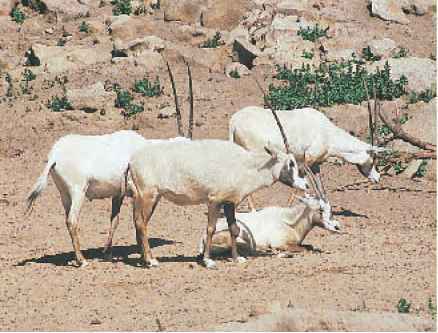 Figure 17 The Arabian oryx was saved from extinction because a captive population was created before the wild population disappeared. CaptivePopulationS The Arabian oryx, shown in Figure 17, is native to desert lands of the Arabian Peninsula. People hunt the oryx for its horns and hide. Hunting increased during the twentieth century, when four-wheel-drive vehicles became available to hunters. In 1962, to prevent the species from becoming extinct, several oryx were taken to the Phoenix Zoo in Arizona. By 1972, no more wild oryx lived in the desert. A captive population is a population of organisms that is cared for by humans. The captive population of oryx in Arizona did well. Their numbers increased, and hundreds of Arabian oryx now live in zoos all over the world. Keeping endangered or threatened animals in captivity can help preserve biodiversity. It is not ideal, however. It can be expensive to provide proper food, adequate space, and the right kind of care. Also, captive animals sometimes lose their wild behaviors. If that happens, they might not survive if they're returned to their native habitats. The best approach is to preserve the natural habitats of these organisms so they can survive on their own. Visit booke.msscience.com for Web links to information about reintroduction programs. Activity Find out about a reintroduction program and write a summary of the program's progress. Reintroduction Programs In some cases, members of captive populations can be released into the wild to help restore biodiversity. In the 1980s, wildlife managers began reintroducing captive oryx into their desert habitat. Reintroduction programs return captive organisms to an area where the species once lived. Programs like this can succeed only if the factors that caused the species to become endangered are removed. In this case, the rein-troduced oryx must be protected from illegal hunting. Plants also can be reintroduced into their original habitats. The island of St. Helena in the South Atlantic was home to the rare St. Helena ebony tree. In the 1500s, European settlers introduced goats to the island. Settlers also cut trees for firewood and timber. Goats overgrazed the land, and native trees were replaced by introduced species. By 1850, the St. Helena ebony was thought to be extinct. In 1980, two small ebony trees were found on the island, high on a cliff. Small branches were cut from these trees and rooted in soil. These cuttings have been used to grow thousands of new ebony trees. The new trees are being replanted all over the island. Seed Banks Throughout the world, seed banks have been created to store the seeds of many endangered plant species. If any of these species become extinct in the wild, the stored seeds can be used to reintroduce them to their original habitats. Relocation Reintroduction programs do not always involve captive populations. In fact, reintroductions are most successful when wild organisms are transported to a new area of suitable habitat. The brown pelican, shown in Figure 18, was once common along the shores of the Gulf of Mexico. 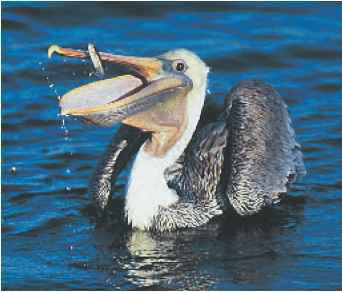 Pelicans eat fish that eat aquatic plants. In the mid-twentieth century, DDT—a pesticide banned in 1972 in the U.S.—was used widely to control insect pests. It eventually ended up in the food that pelicans ate. Because of DDT, the pelican's eggshells became so thin that they would break before the chick inside was ready to hatch. Brown pelicans completely disappeared from Louisiana and most of Texas. In 1971, 50 of these birds were taken from Florida to Louisiana. Since then, the population has grown. In the year 2000, more than 7,000 brown pelicans lived in Louisiana and Texas. Figure 18 Brown pelicans from Florida were relocated successfully to Louisiana. What two things led to the recovery of the brown pelican? 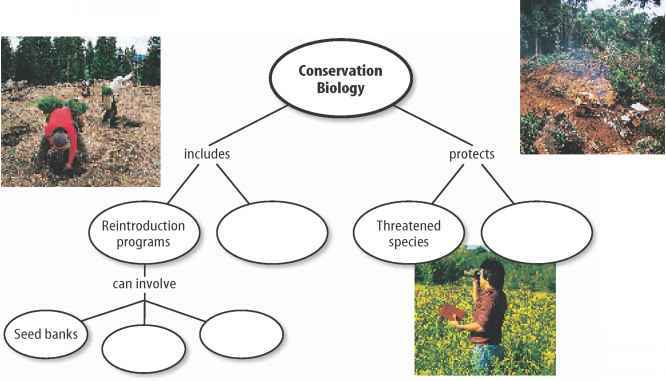 • Conservation biology deals with protecting biodiversity. • Conservation plans must take into account the needs of the human population because human activities often are the reason species are at risk. • Conservation plans are designed to protect a species from harm and protect their habitat. • Laws, habitat preservation, wildlife corridors, and habitat restoration are techniques used to protect a species and its habitat. • Sometimes captive or wild populations can be released into a new area to help restore biodiversity. 1. Explain how the U.S. Endangered Species Act helps protect species. 2. Describe what factors can make it difficult to reintroduce captive animals into their natural habitats. 3. Think Critically As a conservation biologist, you are helping to restore eelgrass beds in Narragansett Bay. What information will be needed to prepare a conservation plan? 4. Recognize Cause and Effect Imagine creating a new wildlife preserve in your state. Identify uses of the area that would allow people to enjoy it without harming the ecosystem. What kinds of uses might damage the habitat of species that live there?